Tracking down one rogue android host across the sprawling American frontier is like finding a needle in a haystack, as Charlotte Hale (Tessa Thompson) puts it, with one important difference: The haystack is an ultra-realistic Old West theme park stuffed to the gunwales with tons of other needles that want to kill you. Mortal peril aside, that’s the quest Bernard Lowe (Jeffrey Wright), the park’s head of programming and a stealth host in employee’s clothing, and Charlotte, executive director of the subsidiary overseeing the park, undertake in Westworld’s Season 2 premiere, running from danger as they seek a safe haven with access to the park’s systems. The good news: Charlotte knows of an underground bunker buried in a patch of nowhere beneath Westworld's rolling hills. The bad news: Well, there’s all kinds of bad news, what with the full-on murderous rebellion going on aboveground, plus the sobering reveal that Westworld’s parent company, Delos, has been collecting guest experiences and their DNA for ostensible recordkeeping purposes. But this is secondary to Charlotte’s mission: She needs to find Peter Abernathy (Louis Herthum), Dolores' father and the first host in Westworld to go haywire and recall his past memories, and deliver him to Delos HQ. He’s a walking hard drive containing all of Westworld’s data (after Charlotte uploaded that code into him in the Season 1 episode “Trace Decay”). If she can’t, Delos plans to leave her and Bernard high and dry in a war zone. That’s capitalism for you. To track down his location, Bernard has a solution: “I’ll need to hardline into the host mesh network,” he tells her, explaining that the hosts are subconsciously linked to other hosts in close proximity; this way, they can bounce information between one another and avoid stumbling into narratives not their own, which keeps the guest experience running smoothly. Think about every time you’ve tried to access Wi-Fi in your house, or a friend’s house, or some Wi-Fi supported public space, and found yourself in a dead zone. Frustrating, right? That's where mesh networking comes in handy -- a fancypants term for an otherwise simple fix to an irritating problem. In a nutshell, a mesh network is a series of routers, aka nodes or connection points, peppered throughout a space where each of those routers "talks" to the others, ultimately expanding the range of Wi-Fi coverage within that space. Suddenly, all those pesky dead zones are no longer dead. Mesh networks, of course, are really only worth setting up in a large space, like a museum, or an office, or -- drumroll -- an Old West theme park built on an island. 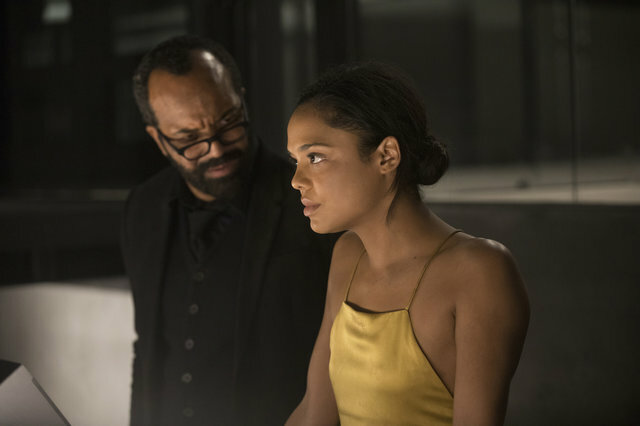 What this could mean for Westworld is yet to be revealed: Bernard, after extracting and shooting up a vial of cortical fluid from an offline host, successfully locates Peter, which means he and Charlotte will soon be hot on his trail. But now that we know the hosts in Westworld can communicate on a subliminal level -- further tying in the bicameral mind theory so important to Season 1 -- it can only spell further trouble in an already tight situation. Andy Crump is a contributor for Paste magazine, The Playlist, WBUR's The ARTery, Slant Magazine, The Hollywood Reporter, and Birth. Movies. Death., and is a member of the Online Film Critics Society and the Boston Online Film Critics Association. Follow him on Twitter @agracru.